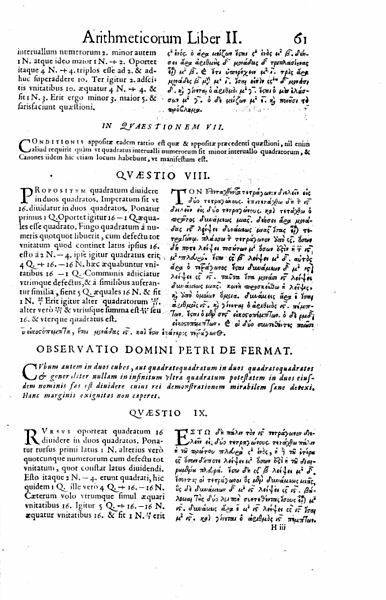 Probably, Fermat was only able to prove the new theorem for n = 4 using his proof by infinite descent: Fermat proved that there are not three numbers x, y, z such that x4 + y4 = z2 . First of all, we can suppose that x, y, z are co-prime from (x2)2 + (y2)2 = z2. If <x,y,z> = d, then we can divide all the equation by d2 and we’ll have another equation (x2)2 + (y2)2 = z2 with <x,y,z> = 1. Now, from the solution of the Pythagorean triples, there are p, q such that x2 = 2pq, y2 = p2 – q2 and z = p2 + q2. We can observe that y2 = p2 – q2 implies that p2 = q2 – q2 is another Pythagorean triple so there are u, v co-prime such that q = 2uv, y = u2 – v2 and p = u2 + v2. So, x2 = 2pq = 2(u2 + v2)(2uv) = 4(uv)(u2 + v2). Since <p,q> = 1, we know that <uv,u2 + v2> = 1 and since their product by 4 is a perfect square, they must be perfect squares too. So there exists a < p such that a2= u2 + v2 = p.
Finally, if we had (x2)2 + (y2)2 = z2 , we have obtain p and q co-prime with z = p2 + q2. Then it is possible to obtain another pair u and v co-prime with p = u2 + v2 and p < z, u < p and v < q. So we can iterate this algorithmic procedure so we’ll obtain a set of pairs of natural numbers each of them lower than the previous and this fact is false, since we’d have an infinite decreasing succession of natural numbers without end! He worked with numbers of the form a + b√-3 to find two new numbers a and b less than p and q such that p2 + 3q2 = cube and then he applied the method of infinite descent. Unluckily, he made some mistakes working with the new complex numbers a + b√-3. This story is so exciting but, almost quoting Fermat, this post is too short to contain everything. If you are interested in, you must read Simon Singh’s Fermat last theorem which is as interesting as the theorem itself.